Posted January 9, 2018, in Publications. 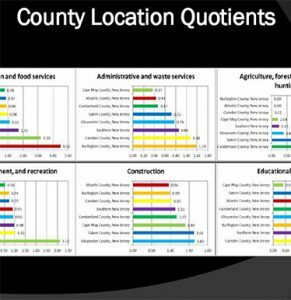 Featuring data from 2012 on South Jersey industry clusters, this presentation gives an overview of employment percentages by industry and geographic concentration of business sectors (e.g. administration, construction, health care, etc.) and draws appropriate conclusions based on the aggregated data. Page last updated by Senator Walter Rand Institute for Public Affairs at 1:46 pm January 9, 2018 . This page was printed from http://rand.camden.rutgers.edu/2018/01/09/2012-southern-new-jersey-industry-employment-presentation/ at 8:19 PM Saturday, April 20, 2019.